Siva (Sunil) and Karthik (Naga Chaitanya) are brothers. Elder brother Siva is a timid and shy. He fears for everything. Karthik is a dynamic guy who is very protective of his elder brother. Siva gets the job of a cop when his cop father dies. Siva is transferred to a seashore town where crime rate is high. Karthik goes in the guise of Siva and combat with anti-social elements whenever such situation arises. The crime rate goes down and people start respecting Siva as their savior. The rest of the story is all about what happens when the villains come to know that Siva is a fearing man and he is protected by his brother. Actors: Naga Chaitanya is extremely convincing in a mass role that requires good action orientation. He has played an all-round character and did complete justice to it. His dialogue delivery and diction has improved a lot. This film is his first successful step towards becoming a mass hero. Sunil breathes life into his character by portraying his role perfectly. 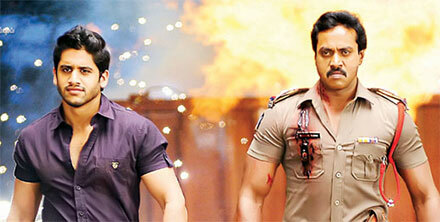 With the help of right characterization by director, Sunil delivers superb performance. He has shown nice variation in body language and expressions before and after an incident in the movie. The police get-up in the pre-climax and climax of the film suited him very well. Tamanna adds glamor to the movie as the love interest of Naga Chaitanya. Andrea Jeremiah is nice as wife of Sunil. Ashutosh Rana is powerful as a villain. Brahmanandam is good as a jealous neighbor. Vennela Kishore is entertaining as a groom to Tamanna. Raghubabu delivers a memorable performance. Ex journalist Murali impresses as a superior to Sunil. Naga Babu played the role of heroes’ father convincingly. Rama Prabha is good as usual. Story - screenplay - direction: This film is a remake of a Tamil film Vettai. The story of the film has good commercial orientation with good mass elements and family values (bonding of brothers). Director Kishore Parthasani (Dolly) has dealt this mass subject deftly by following the script to a T. Dolly has got good aesthetic sense and he has blended those aesthetics nicely into the narrative without losing the mass flavor. There is a danger of having Tamil flavor when a Tamil film is remade. But the director has made sure that the film looks like an authentic Telugu film. Kishore Parthasani will go to a bigger league with this movie. Screenplay by Deepak Raj is nice, but should have been fast-paced in the second half. Other departments: Background music by Thaman is nice. Songs look good visually. Cinematography by Arthur A Wilson is of top-notch. Dialogues by Vema Reddy and Dolly are good. Action choreography by Ram Lakshman, Kanal Kannan and Ravi Varma is stylish. Editing by Gowtam Raju is decent. Producer Bellamkonda Ganesh Babu has made sure that the money spent on the film is transferred onto the screen. First half of the film is entertaining. Second half is okay though it’s little lengthy. The director has stuck to the scripts and two heroes did their part well without going for any ego issues. The plus points of the movie are script, performances and direction. On the flip side, a crispy second half with more entertainment orientation would have made this film a bigger hit. On a whole, Tadakha has all ingredients to satisfy masses and movie lovers who have insatiable thirst for a decent cinema this summer. It's a minimum guarantee film that surely going to hit bull’s eye.